All 3MBS Subscribers receive a 3MBS Subscriber Card in the mail. We are always updating our list with new deals and partners! So now you can not only feel good about supporting Melbourne’s best Fine Music radio station, you can also receive discounts from some of our friends in Melbourne. These include…. 3MBS Subscribers are entitled to the Industry Concession rate upon sight of their 3MBS Subscriber Card at the box office. 3MBS Subscribers receive a 15% discount on Flinders Quartet Collins Street 2019 concert tickets. Quote the subscriber code when booking through Melbourne Recital Centre box office. Receive a 10% discount* on single tickets to Musica Viva’s 2019 International Concert Season. Quote the subscriber code when purchasing tickets through Musica Viva. Call 1800 688 482 or visit musicaviva.com.au. *Offer excludes Musica Viva Festival, Melbourne Morning Masters, Sydney Coffee Concerts, concession tickets and Under 40 discounts and cannot be used in conjunction with any other promotion. 3MBS subscribers receive a 20% discount on single tickets to Heidelberg Symphony concert when booking on 9005 1792. 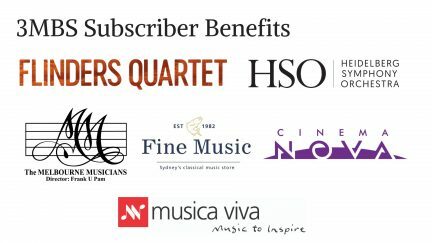 3MBS Subscribers receive a 20% discount on single tickets to The Melbourne Musicians concerts when using the subscriber code. 3MBS Subscribers receive a 10% discount on all purchases made through www.fishfinemusic.com.au when using the subscriber code. To access the subscriber codes for each of these discounts please contact the Subscriptions & Engagement Manager on subscriptions@3mbs.org.au or call 9416 1035. Codes will only be provided to current 3MBS subscribers. If you want to find out more about these discounts or you want to offer a product or service to our 3MBS Subscribers, call 9416 1035 and ask to speak to the Subscriptions & Engagement Manager. These offers are subject to change and 3MBS or the organisation reserve the right to alter the agreement at any time.